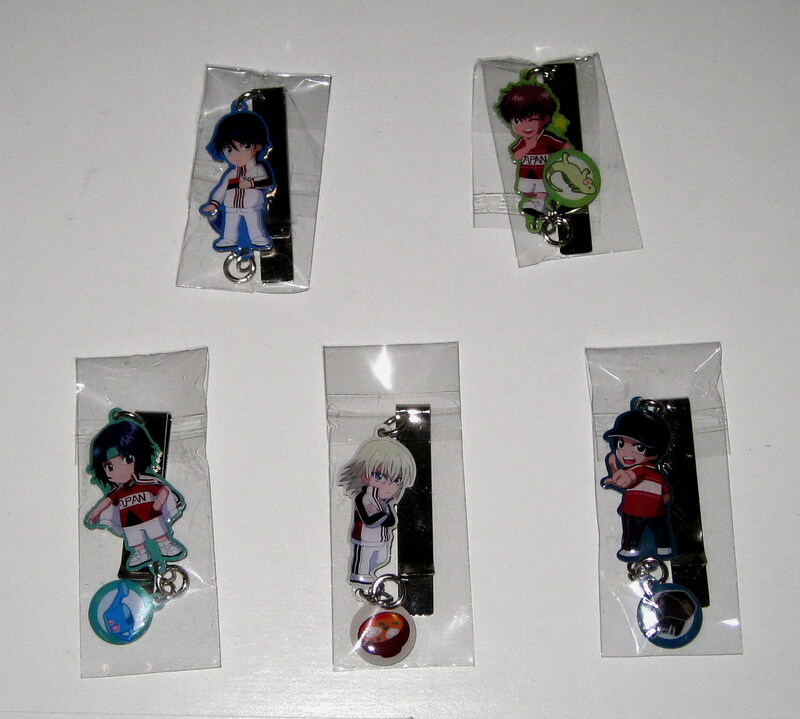 I manage to restock these too!!! 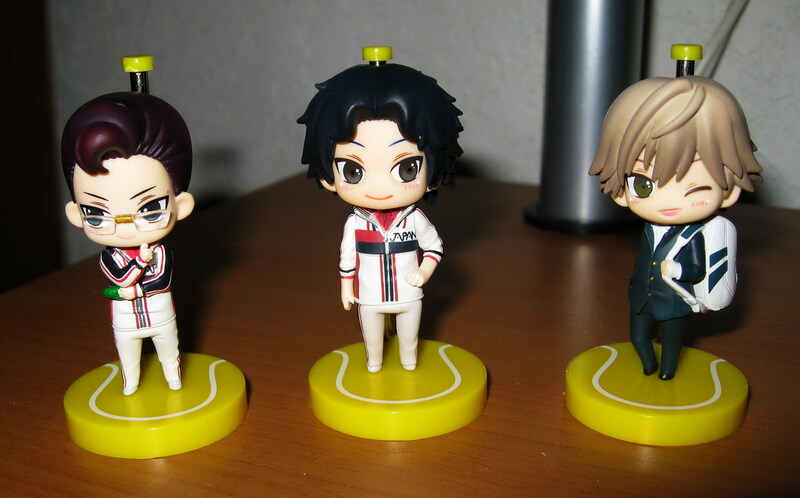 Released in December 2011, these are really really nice!!! 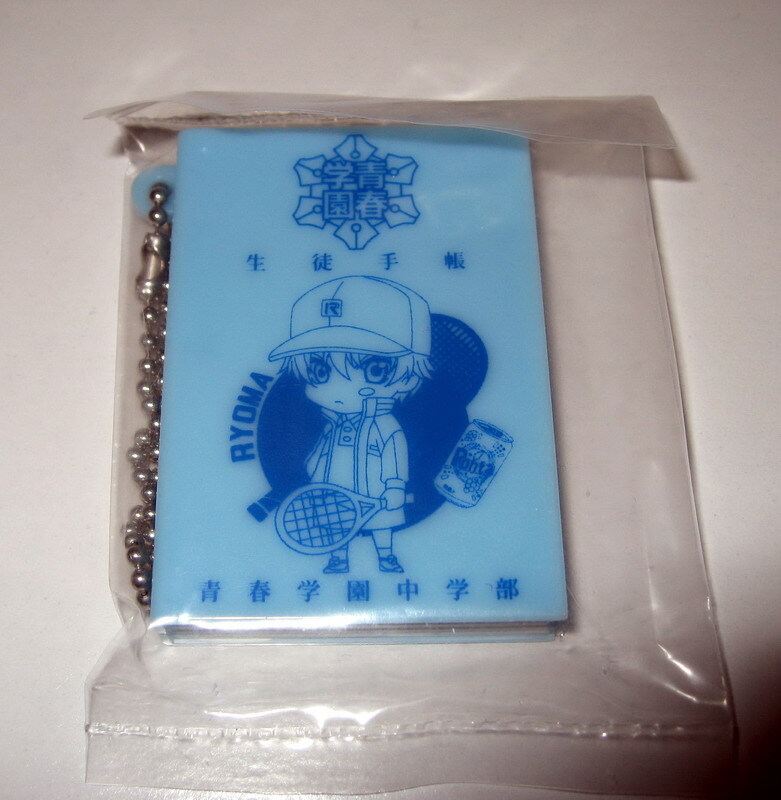 Made of really nice zinc alloy, very high quality, size 1.25"x2.5" (2.8x6.3cm), with a tennis ball made of iron. 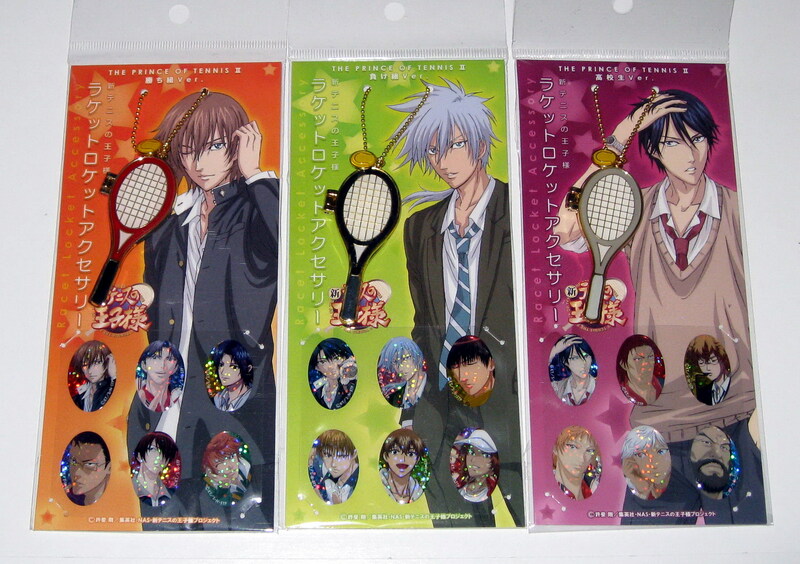 There are six opalescent sparkle team stickers and 12 tiny stars with each racket locket. 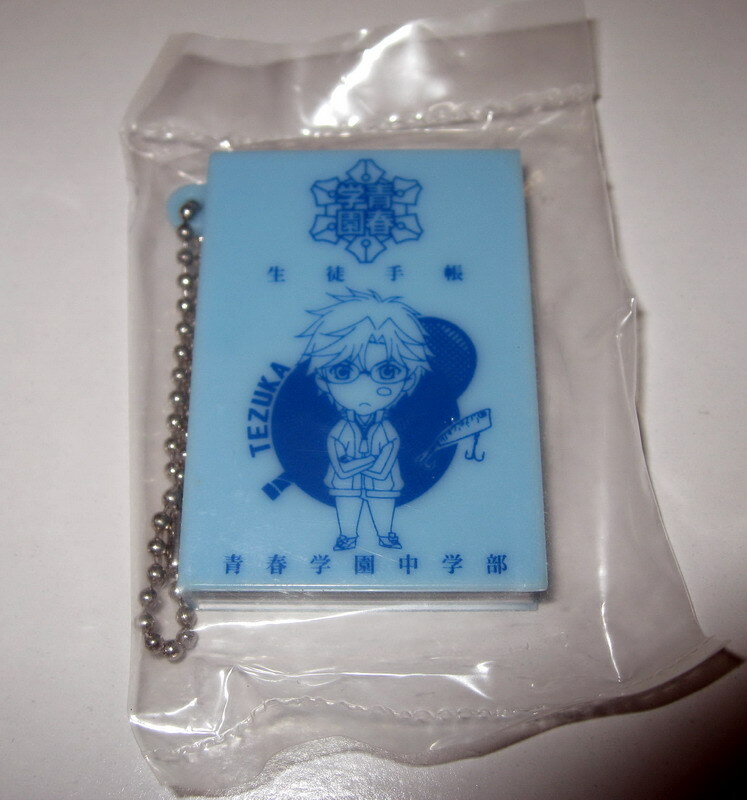 The stickers are made of plastic resin so they're raised, not flat!!! You can put your own photos into the lockets, and use the stickers on your cell phone. 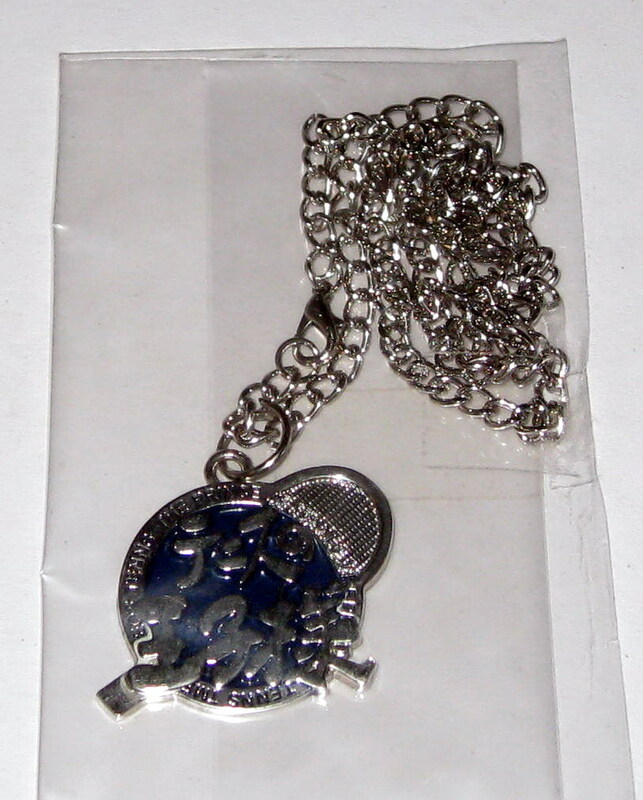 These are beautiful message clips made from high quality zinc alloy. 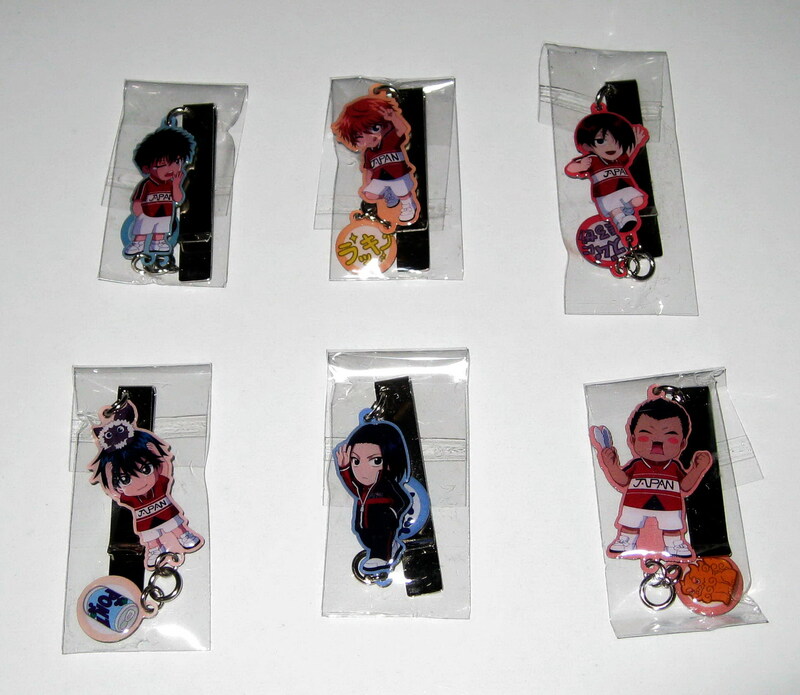 They depict the boys in very cute chibi form holding various oversized school supplies/accessories =) Each clip has a little pole on the back to stand them up, it's really neat ^___^ I only have one of each, get them while you can! 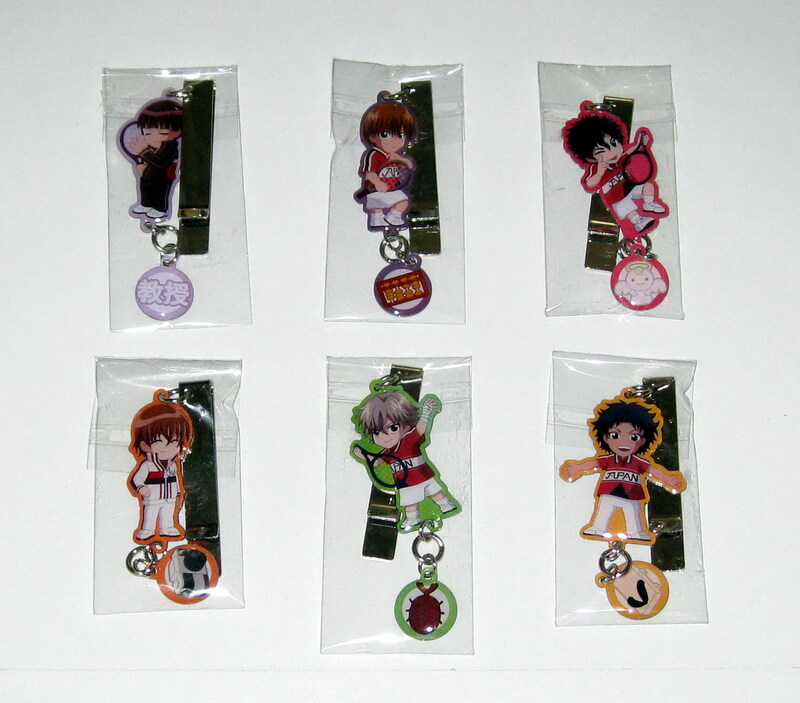 The Shinpuri Birthday Charm Collection consists of picture plates along with a name plate with each character's birthday and color!!! I would assume that the silver sides are raised with the hole depressions where they will be colored in for the respective month~ They are made of metal zinc alloy of 7.5cm in length. 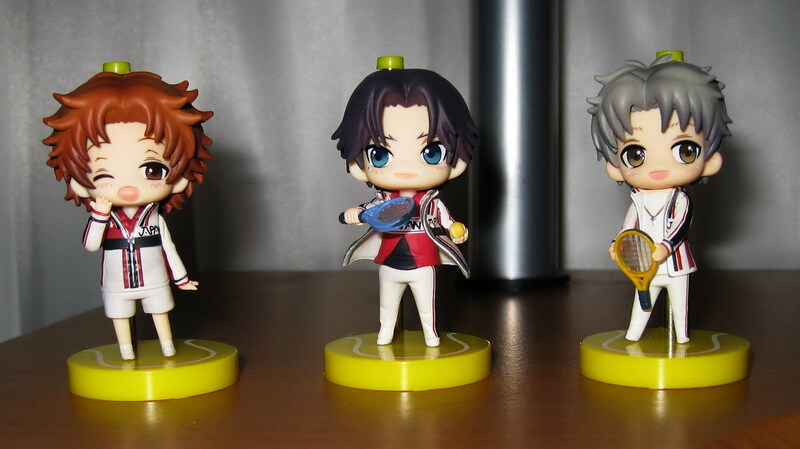 These are the latest one-coin figures featuring the Tenipuri boys! They came in just this week!! 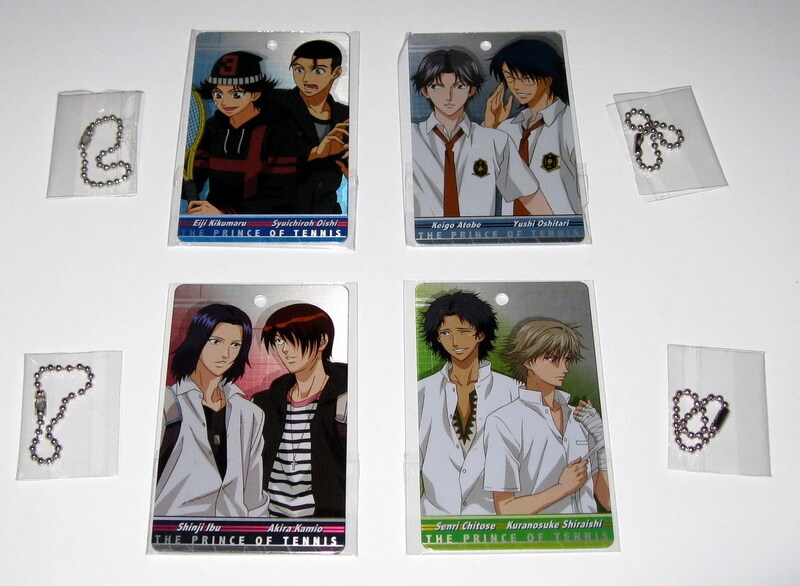 The figures I'm selling are BRAND NEW in their original box and plastic casings~ There are two of each, the ones without a name are available. Please let me know if you want them!!! 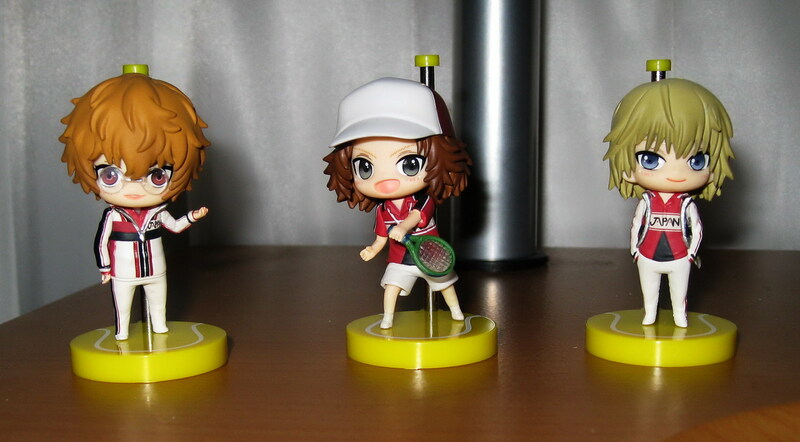 These are the latest one-coin figures featuring the Tenipuri boys! Not to worry, the photos taken are of my set, the ones I'm selling and that you'll get are BRAND NEW in their original box and plastic casings~ Let me know if you're interested! 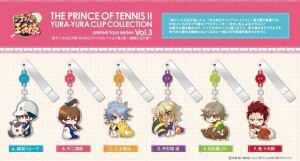 Similar to the Tenipuri Yura Yura clips I sold way back when! 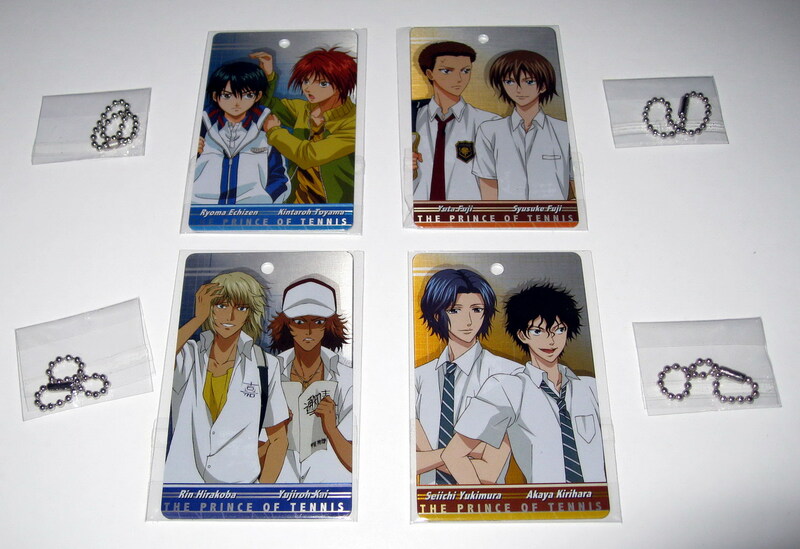 The clips are made of stainless steel, and the charms are made of stainless steel with plastic resin coating =) This is the second installment of the New Prince of Tennis series!!! Very nice!!! 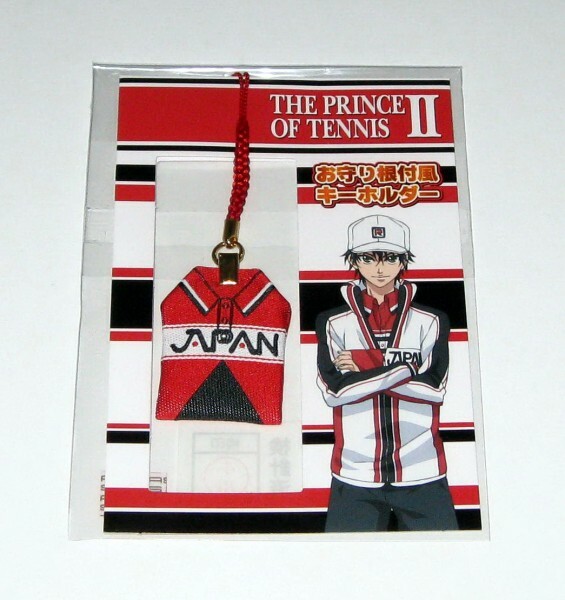 Similar to the Tenipuri Yura Yura clips I sold way back when! 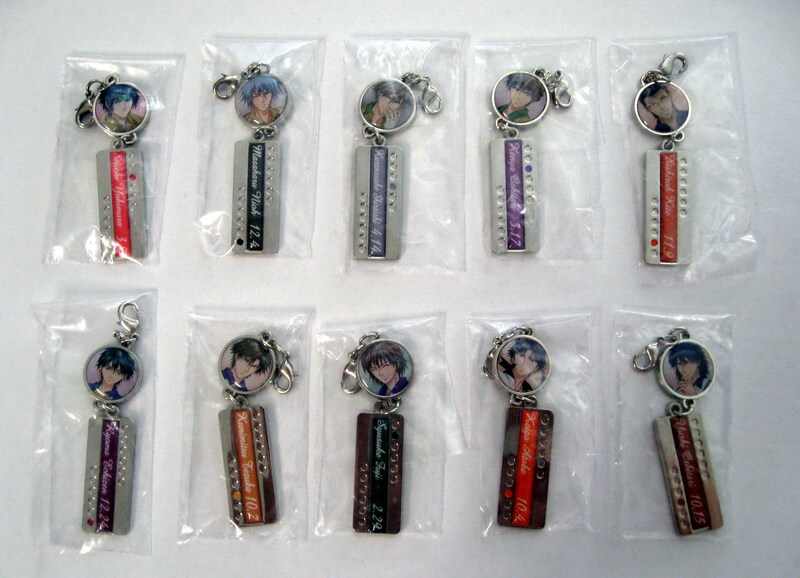 The clips are made of stainless steel, and the charms are made of stainless steel with plastic resin coating =) Very nice!!! These are made of beautiful GOLD plated ZINC ALLOY with raised RESIN coating~~ They look A LOT nicer than my camera could capture ♪（ｖ＾＿＾）ｖ COMPLETELY DISCONTINUED, I'm reposting some of the ones I put away!! 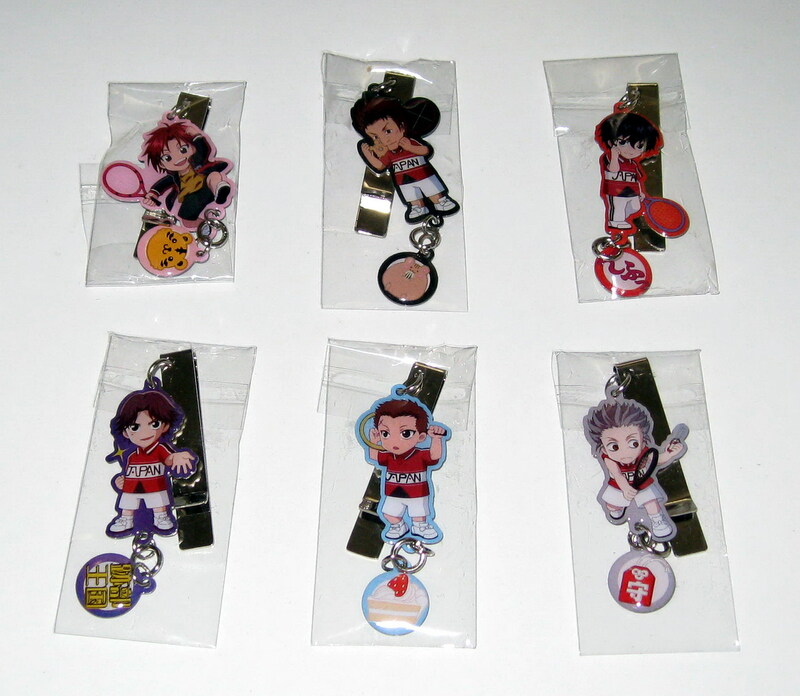 These are high quality, heavy duty, metallic plates with a keyholder chain, good size of 2.3"x3.5" or 5.4x8.6cm! 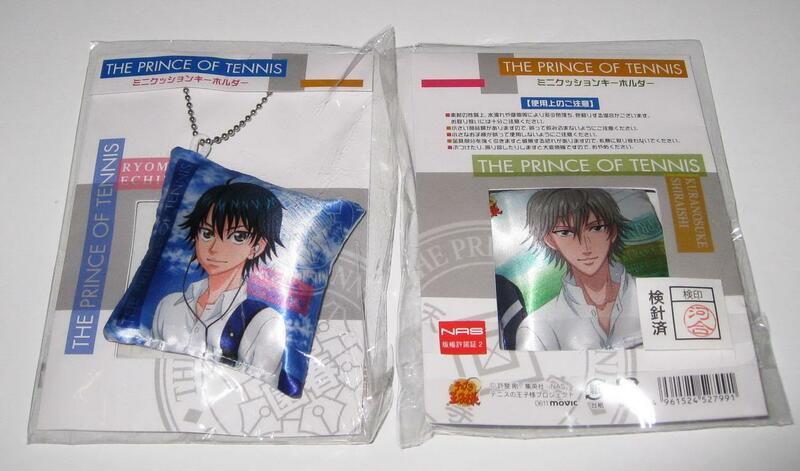 Just like the volume 1 from last year of the boys in pairs, these have the boys by themselves. They are SOOOOOOOO GOOD LOOKING!!!! Since it's New Years, just thought I'd put these out to sell =) These are little plastic boxes with sticks of fortunes inside. On each stick is a different fortune, but in general, this is what the characters mean: great blessing (dai-kichi, 大吉), middle blessing (chuu-kichi, 中吉), small blessing (shou-kichi, 小吉), curse (kyou, 凶)~~ See what the boys tell you this year!! 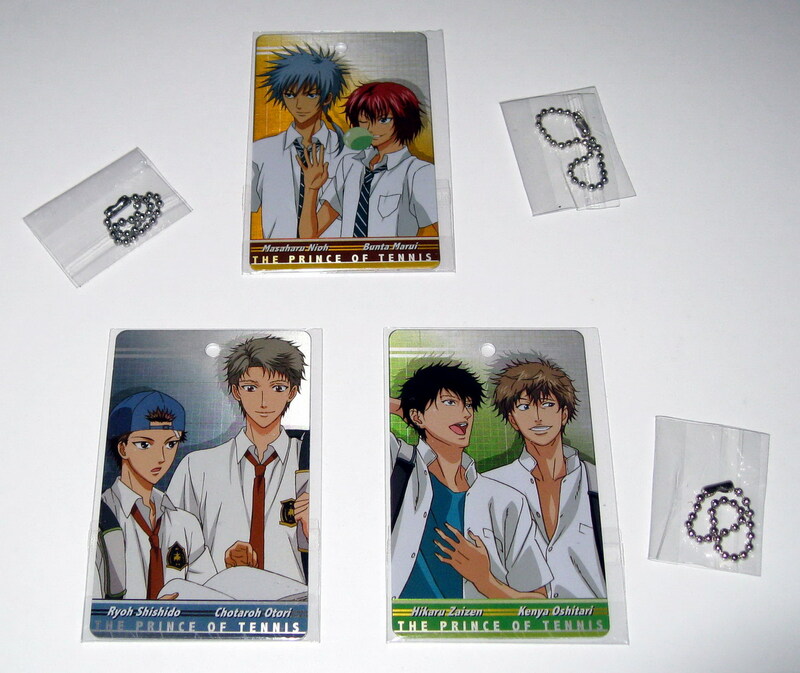 These are high quality, heavy duty, metallic plates with a keyholder chain, good size of 2.3"x3.5" or 5.4x8.6cm! There are 12 designs and they're really really nice~~ The front have the pairs of boys, and the back has their BEAUTIFUL SCHOOL EMBLEMS!!!!! 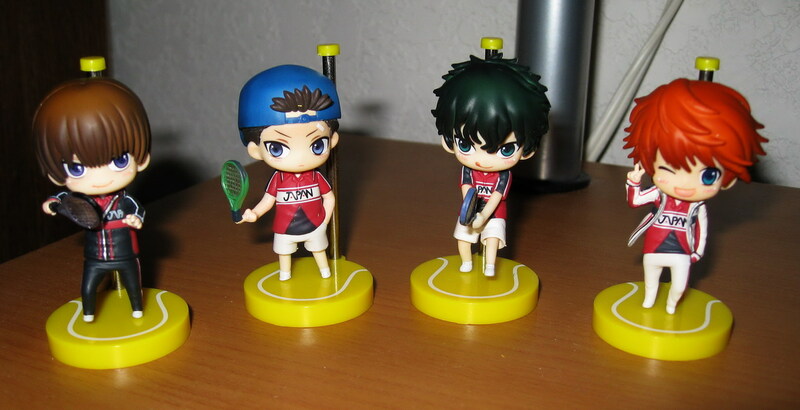 They're released a year ago, but I'm now deciding to sell them =) Definitely a great collectible!!! Please click on the first photo to access the album for the rest! 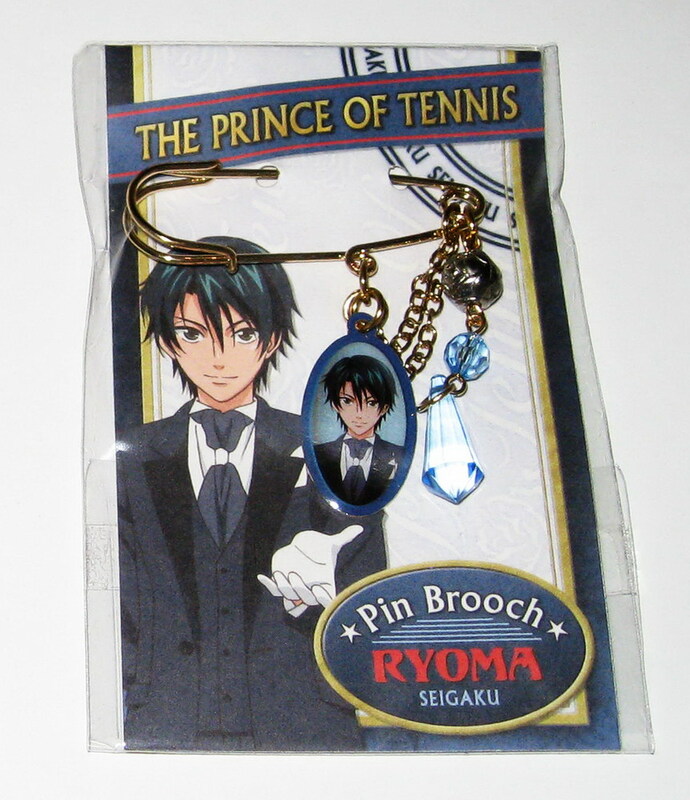 This pin brooch is from the prince formal outfits artwork series of March 2011, released a few days after the Great Tohoku Earthquake. 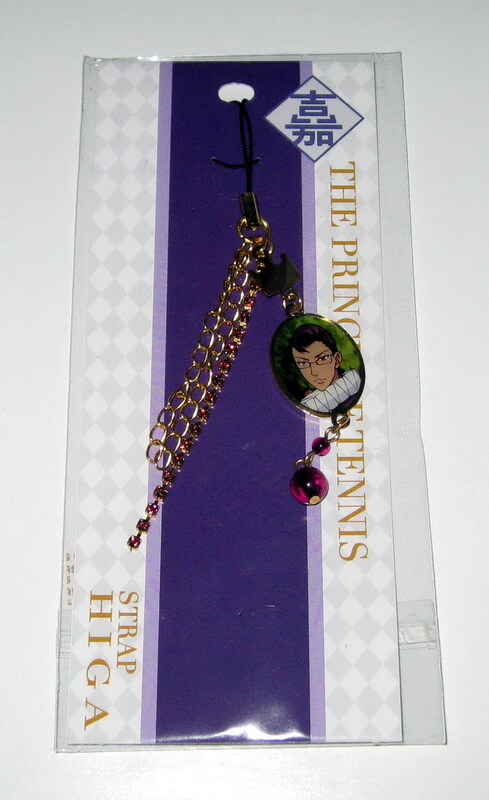 This series is the same with the artwork on the mini clear files set I sold before ^___^ The pin and solid BALL on the chain is of course made of zinc alloy, and JEWEL is made of high quality acrylic resin~~ VERY NICE!!! 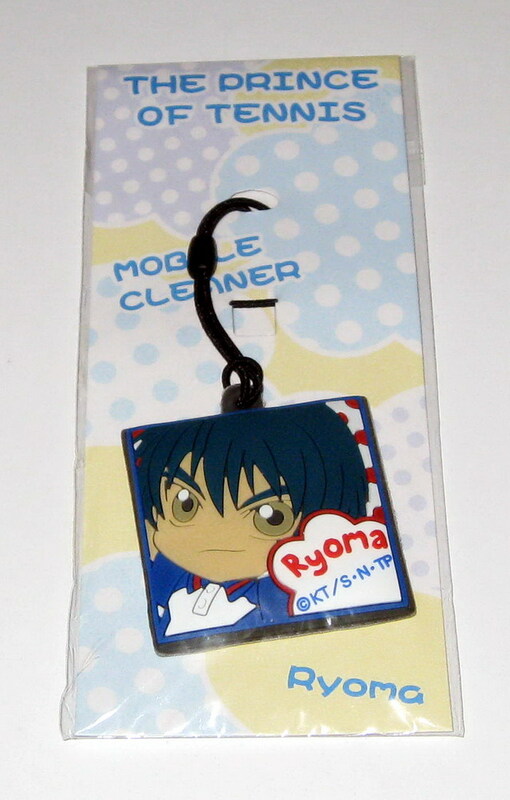 Something to pin onto your purses or backpacks!!! 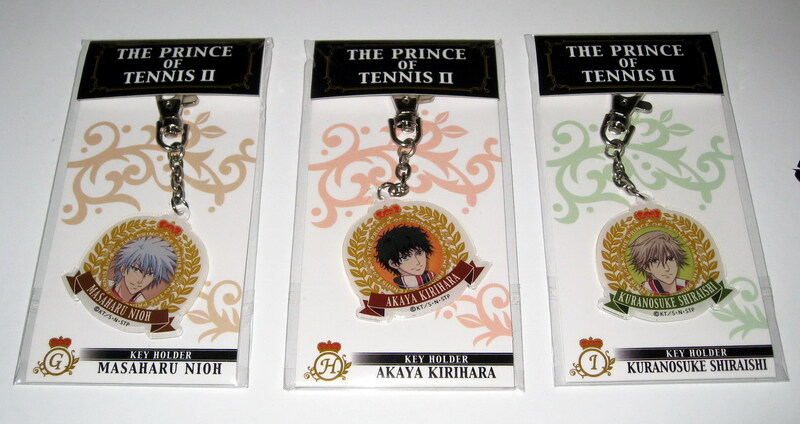 PRINCE OF TENNIS II RESIN KEYHOLDERS . 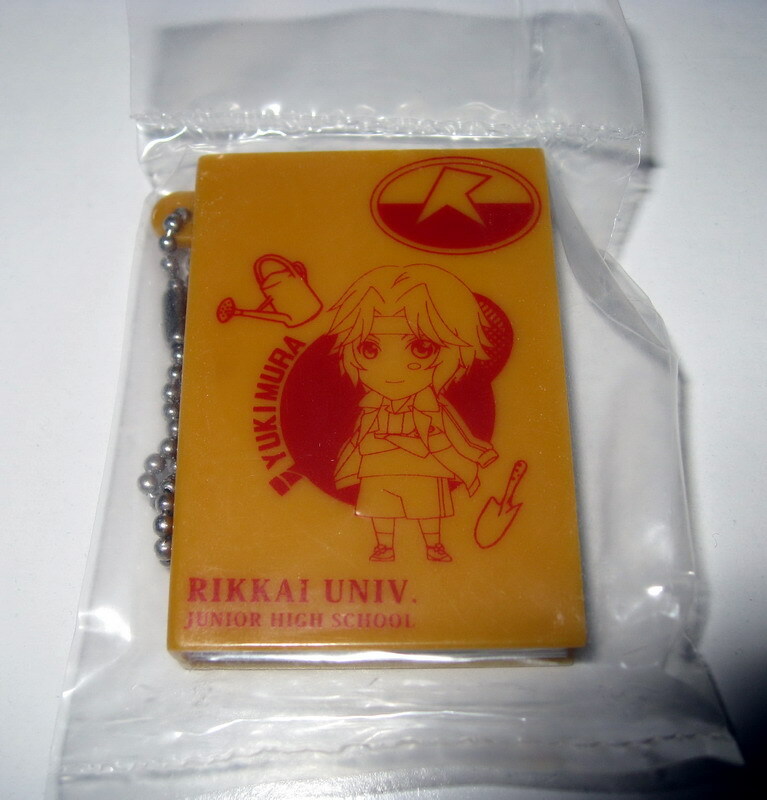 These are BEAUTIFUL, HIGH QUALITY, RESIN keyholders. 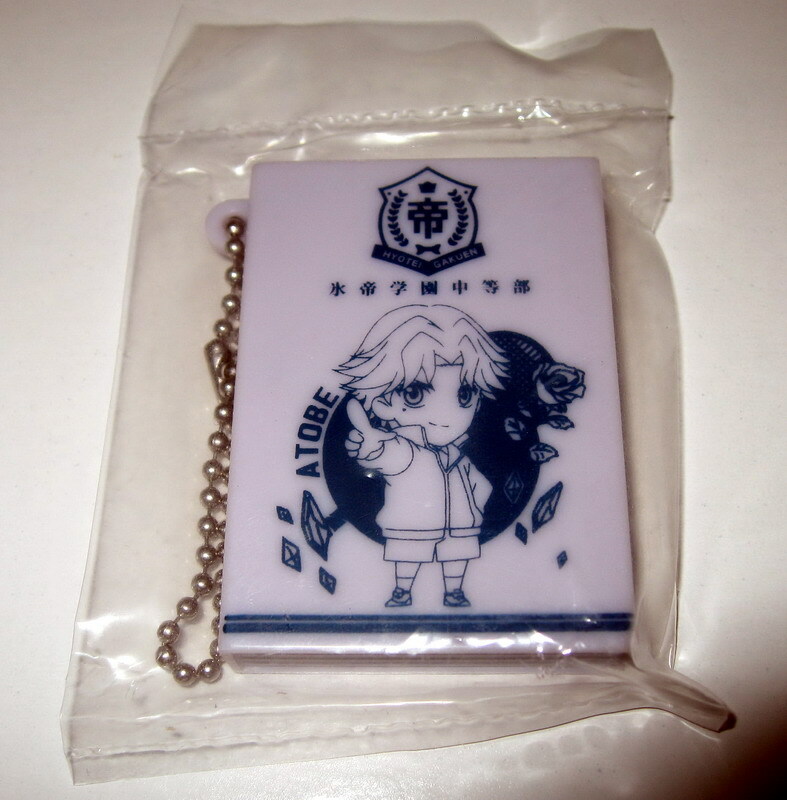 They measure about 4" or 10cm in length, and the resin face is 2"x2" or 5x5cm. Click on the first photo to access the scrapbook for the other photos. First come first served. 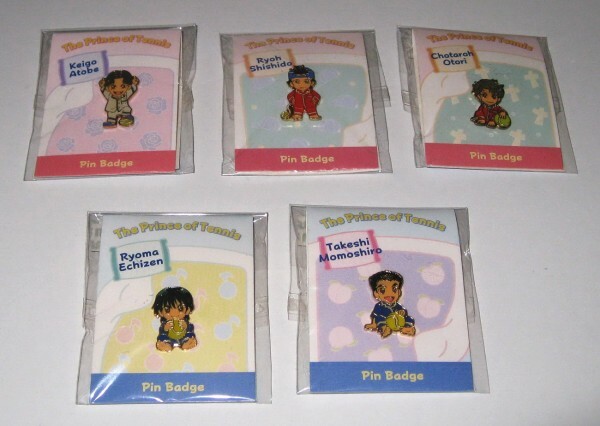 I'm wondering if there is any of the one coin figures that is still available? 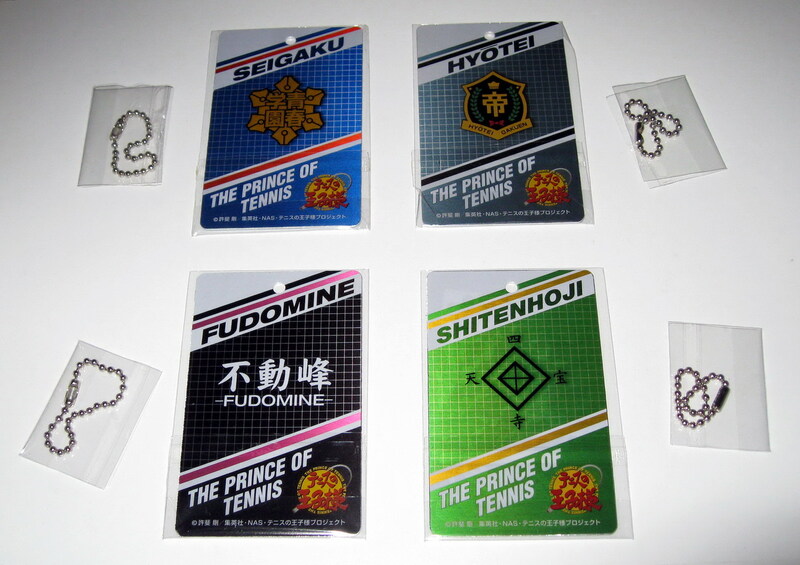 I'm particularly interested with the Marui one. Hello there! Thank you for your message. I apologize I missed the notification. 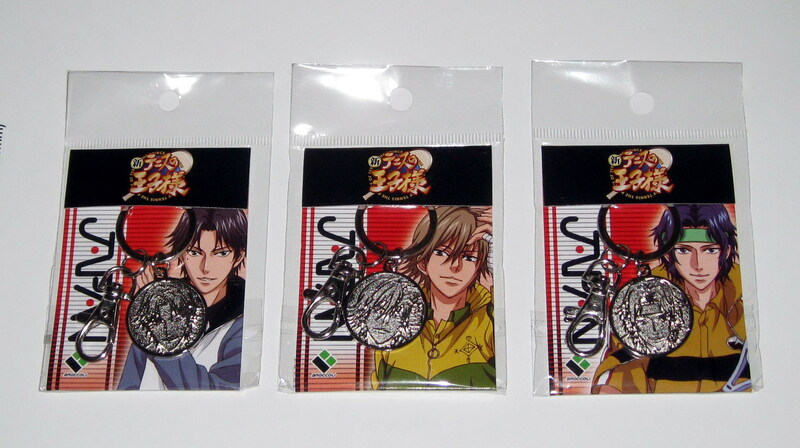 The only one-coins available are those of the characters listed. 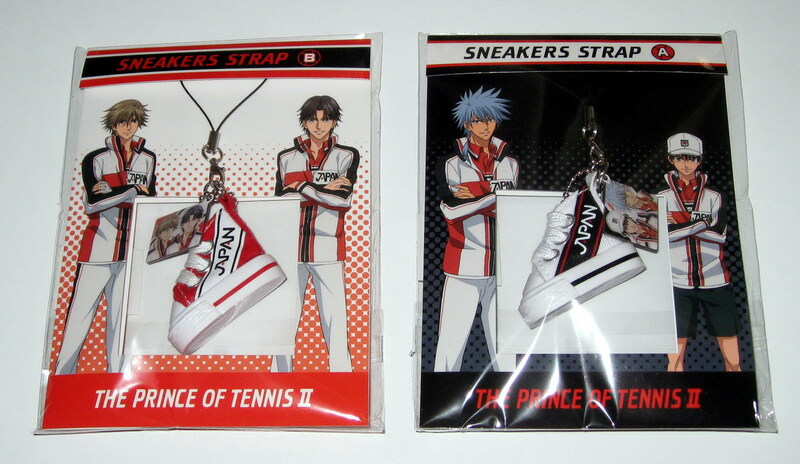 Unfortunately, Marui has already been sold. Would you be interested in anything else? Please let me know! Hi, I was wondering I can make a trade with you for your shiraishi yura yura clip vol. 3 animals. I have a hiyoshi yura yura clip vol. 5 animals, so I was wondering if its possible to make a trade? Hello there, sorry for the delayed response, I was busy with work. Anyways, thank you for your message. Unfortunately, I do not trade any collectibles. You are welcome to buy at the discounted price if you are still interested. Let me know and I will check for availability.